It is with deep sorrow and great sadness that Linfield FC reports the passing of the club's former star inside forward, Phil Scott. The Shankill Road man who lived most of his life in the 'Village' area and who also played for Distillery and Glenavon would have been 72 on May 24. Phil passed away peacefully at his home, close to Windsor Park in the early hours of Thursday morning, after several recent spells in hospital. In his Linfield career Phil scored 220 goals in 400 games in the 1960s and early 1970s. His 2 goals won the Irish Cup Final for Linfield against Ballymena United at Solitude in 1970. The reward for that victory was a European Cup Winners Cup 1st round tie against Manchester City and Phil came off the subs bench for the 1st leg - a 1-0 defeat at Maine Road. 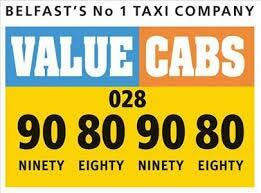 He was an unused sub in the return game at Windsor Park which Linfield famously won 2-1. In recent weeks I had the privilege and honour of calling at Phil's home with Linfield Chairman Jim Kerr, director Stephen Shaw and Phil's former team mate, the legendary Isaac Andrews, as the club bestowed the award of Honorary Life Membership on one of it's former greats. Phil and his family were so proud and grateful that his former club had recognised him in this way and the chat and the banter about the characters in the game from the playing days of Phil and Isaac was immense. Older players have great tales to tell about the game they loved and Phil's memory was razor sharp, as he recalled stories of great games and great personalities of yesteryear. 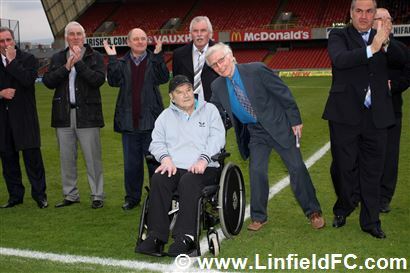 The announcement of Phil's Honorary Life Membership award on Linfieldfc.com gave Phil a real morale boost, as numerous friends contacted him to congratulate him and wish him well. We called again at his home to present him with a Linfield shirt with his name and the number 10 on the reverse and again, he and his family were thrilled to receive such recognition from the club he served with great distinction. I was so happy when his family told me he wanted to visit Windsor Park a few days later to be part of the group of former players who would bid a fond farewell to the South Stand, prior to the last Linfield home league game of the season against Glentoran. The former players were all delighted to see Phil and the South Stand gave him a hero's reception when they were asked to give a special warm welcome to Linfield's newest Honorary Life Member. I've known Phil well for several years and a more dignified and proud man, you couldn't meet anywhere but what struck me most on what has turned out to be his last visit to Windsor Park was the sheer courage and determination of the man to attend the game, despite his failing health. 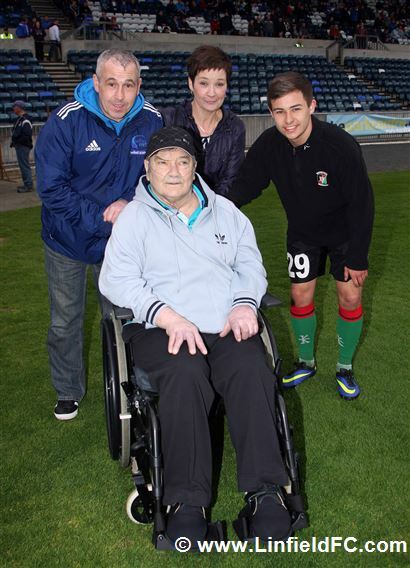 We arranged for a family photo on the pitch including Phil, daughter Pamela, son-in-law Jeff and grand-son Jordan and I know it's a photo that will be framed and cherished in the Stewart and Scott households, along with Phil's proudly preserved medals and the recently presented 'Scott 10' Linfield shirt. 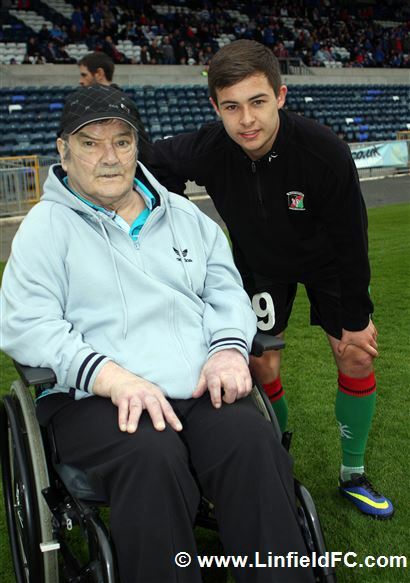 Phil was a Linfield man who supported his family and he was so proud of his grand-son Jordan Stewart who he got to see score at Windsor Park on Easter Tuesday. He was just as proud of his grand-son when he received the invitation to attend the past week's in depth, full time training with Peterborough United. Jordan has returned to his Belfast home today, as Linfield now lead the tributes to his much loved grandfather and the former Linfield inside-forward. I recall the evening of the 7 Trophy 50th Anniversary Tribute Evening at the Ramada Hotel in April 2012 and I remember how thrilled the surviving 7 Trophy Legends were to see Phil when he arrived at the event and that welcome spoke volumes, in terms of the high esteem in which Phil was held by his peers. Phil was also a distinguished guest at a similar 50th anniversary event organised by Distillery last year to mark their famous 1962/63 League Title success. Since I was made aware of the very sad news on Thursday morning, I have felt a tremendous sense of loss and sadness at the passing of my first Linfield hero but I also feel privileged and grateful to have known him well and I'm so proud of the incredibly dignified and courageous way he fought his illness in recent weeks. I'm also proud that his club got the opportunity to honour the achievements of Phil's playing career before his sad passing and I know that both he and his family were delighted at the richly deserved recognition Phil received from the club in recent weeks. It really did mean a lot to Phil and his devoted family. 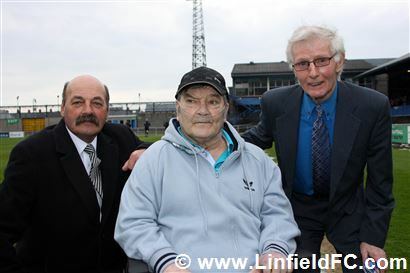 The various recent Linfieldfc.com articles with regard to Phil's receipt of his Honorary Life Membership will be re-produced soon in honour of the great man - tribute articles both he and his family were greatly appreciative of and humbled by. 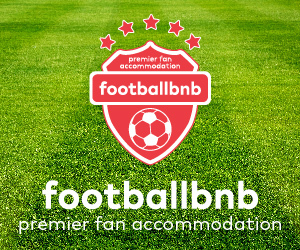 The deepest sympathy and most sincere condolences of everyone connected to Linfield Football Club are conveyed to Phil's family circle and many friends at this very sad time. 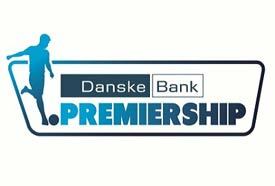 Linfield supporters are asked to remember in their thoughts and prayers Phil's wife Mary, daughter Karen, grandchildren Laura, Casey and Jayci, great grandchild Kye and Phil's other daughter Pamela, son-in-law Jeff and grand children Jordan and Lucy at this very sad time. A funeral service will be held for the great Phil Scott at Melville's on Belfast's Lisburn Road at 11.30am on Tuesday and at Roselawn Crematorium at 1pm. Family flowers only please. 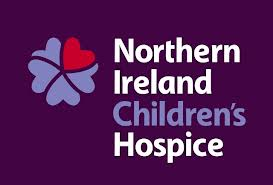 Donations in lieu, if desired, to the Northern Ireland Children's Hospice. 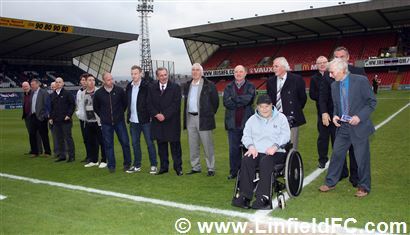 Below - a selection of photos from Phil's Easter Tuesday visit to the Windsor Park pitch he graced with such distinction during his playing career. Above - Legends Peter Rafferty, Phil Scott and Isaac Andrews.